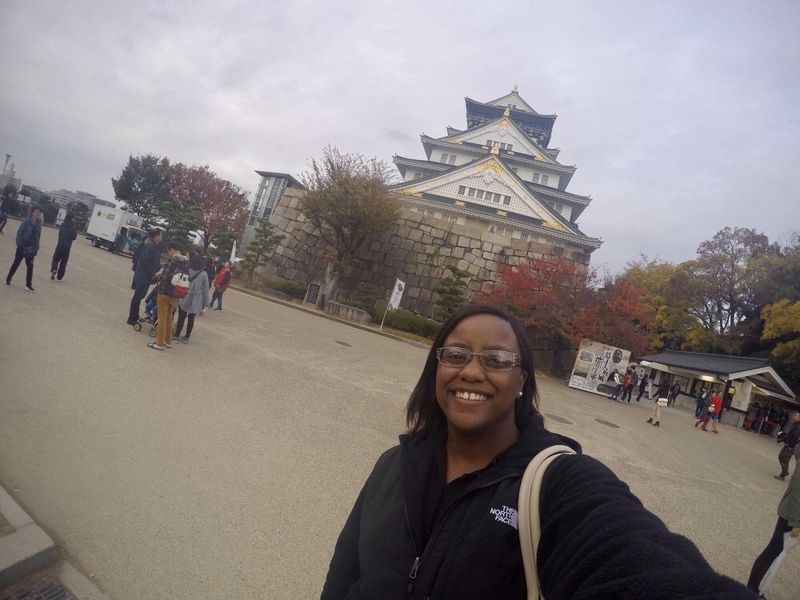 Rounding out my Japan posts, is my post about our two day trips to Osaka and Kyoto. I wish we could have spent more time in these beautiful cities; however, I am grateful for the time that we did have! 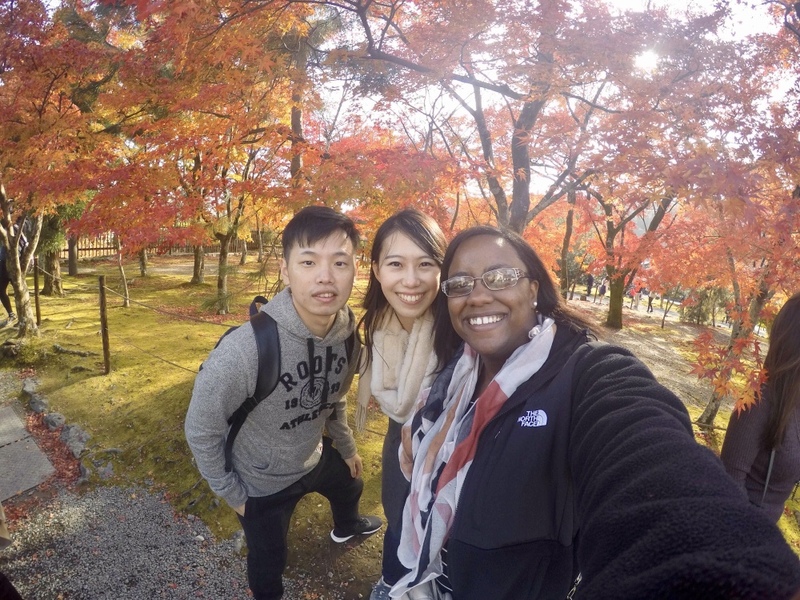 We had the opportunity to eat delicious food, experience the beautiful colors of fall, and take in the exquisite sights in the cities. Come along with me, as I share our day and pictures! 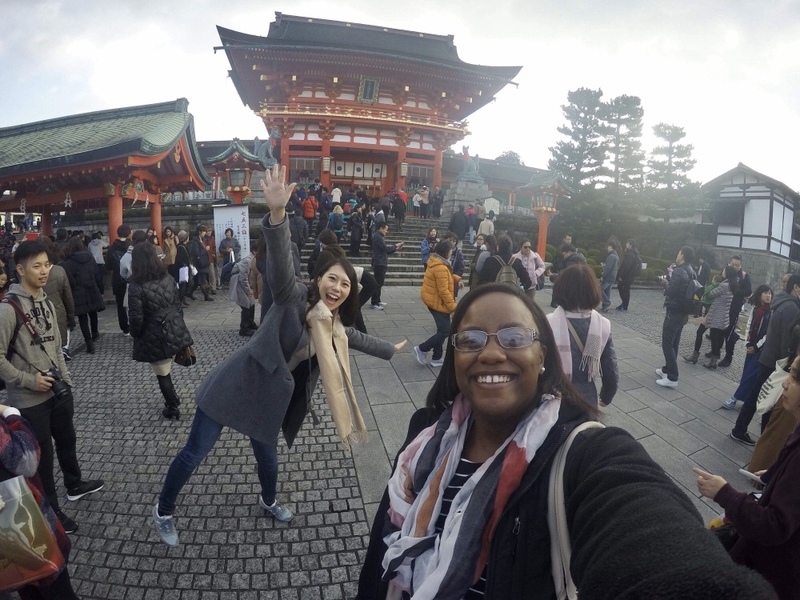 If you would like the comprehensive recount of our travels, start on our Tokyo trip first! Vika and I woke up super early around 4:30am to make our way to Osaka. Telal and his friend, Mike, went to Hiroshima for the day and planned to meet up with us later in Osaka. So we went to the Ikebukuro station thinking we could grab the train there. We were informed we had to go to the Tokyo station to get on the train we needed. Talk about calm panic – we thought we were going to miss the train! We hopped on the metro line for the Tokyo station, and reached it at 6:08am. Somehow we managed to find our train, and our reserved seat by 6:13am – only a mere 3 minutes before departure. We rode this super nice train from Tokyo to Kanazawa, switched trains, and continued onto Osaka. We were meeting up with Kaori, but when we arrived, she was still at work. So we decided to go find somewhere to eat. The place we originally planned to go to fell through. We put the address into Google maps, and it had us going through some fields, so we thought we better scratch that idea and find another location. We just so happened to be walking by the mall, so we decided to stop there. It was a massive mall – with an ice skating rink out front and had an indoor/outdoor aspect. It was pretty neat! We went up to the 7th floor and walked around checking out the various restaurant options. We settled on Italian. We were seated by the window, and the view was incredible. The ice skating rink was right outside, and we could see various individuals enjoying themselves on their skates! I got pizza and milk ice cream, and Vika got seafood pasta and orange ice cream. Her ice cream was SO good! Kaori met us at the mall, and we did a little shopping before heading over to the Osaka Castle. It was truly a magnificent sight. Surrounded by a moat and built high up on large cobbled stones, it overlooked the city. I couldn’t get over how large everything was. The gates and the doors, and just the castle in general! 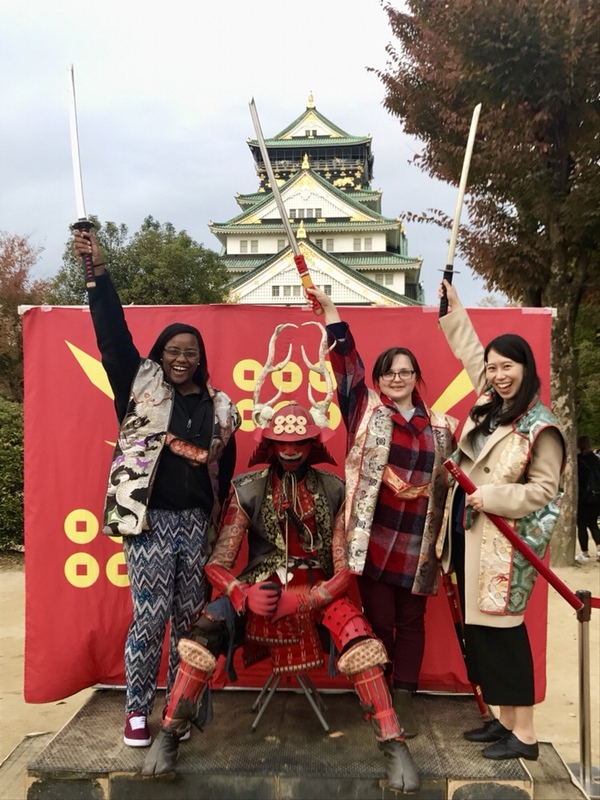 Before entering the castle, we had the opportunity to take a samurai picture, with costumes and swords. It was fun – as the photographer was making do certain poses and make warrior sounds! We had to start at the top and work our way down. We had the option to ride the elevator and then walk down the stairs; or walk all the way up to the 8th floor, and then walk back down. I thought that was pretty interesting. Throughout the different levels, they had 3D projections/holograms depicting each snippet of history. I had NEVER seen anything like it before. It was SUPER cool! We were rushed towards the end because the castle was closing. When they say they are closing at 5:00pm, they are closing at 5:00pm. I was under the impression that as long as you were in by 5, you were good – but no, that’s not the case, so make sure you plan it out better than we did! We headed to the metro station to meet up with Kaori’s boyfriend, Wayne. We then made our way to the Osakanjo station, which is super popular. 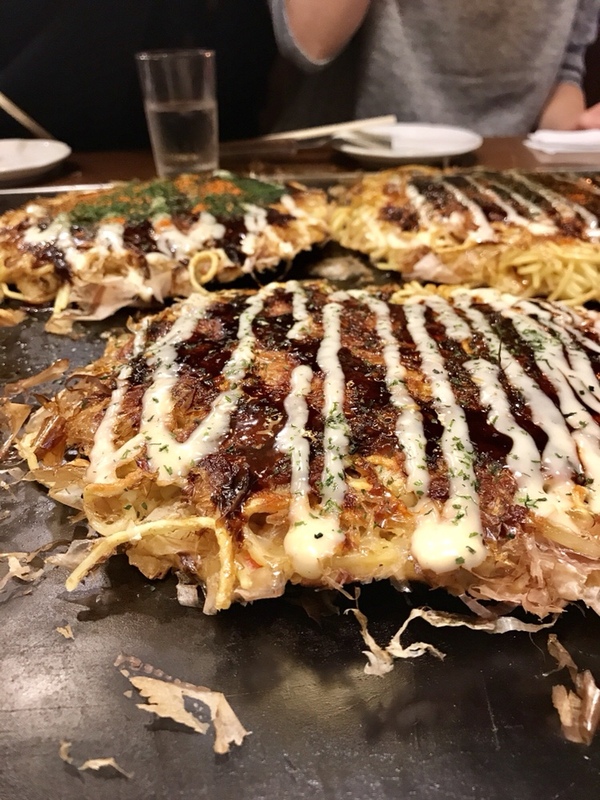 We ate what I called noodle pancakes, but what I know now is okonomiyaki. They were made in front of us, and they were so good! I could not finish mine, as they were also very filling! I tried though – I really tried. 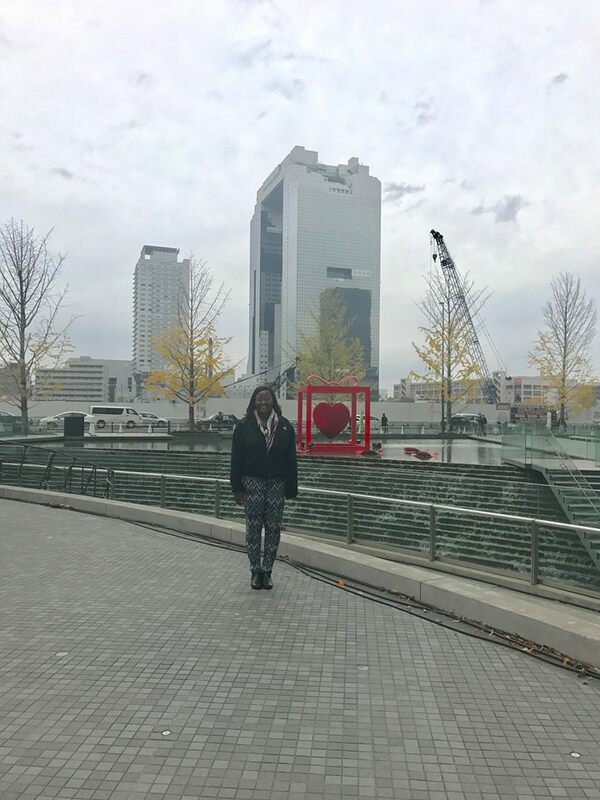 After eating, we explored the area a little, took some pictures with the famous Dōtonbori Sign, and stopped by a coffee shop. I was still so full from dinner, I couldn’t even think about drinking coffee! Afterwards, we headed back to the station and parted ways with Kaori and Wayne. We were meeting up with them again the next day in Kyoto! We woke up early again to make sure we were at the train station with ample of time to find our train. 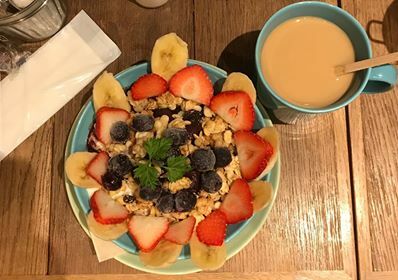 We were there so early, we had time to sit down at a cafe and enjoy breakfast – I had an acai bowl, while Vika had rice porridge [which was so good!]. 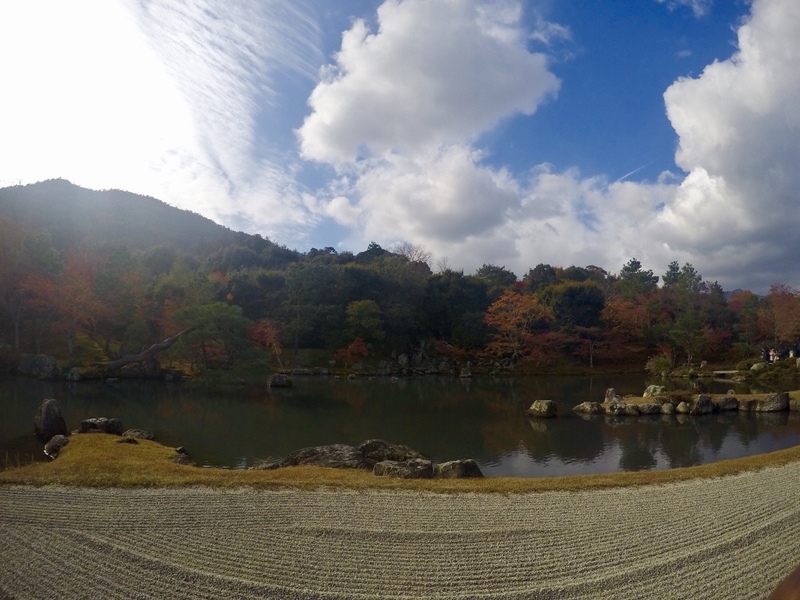 We took the train to Kyoto, which wasn’t too long, and we all met up with each other. We placed our belongings in lockers available throughout the station, so we could enjoy the day without being lugged down by our bags. 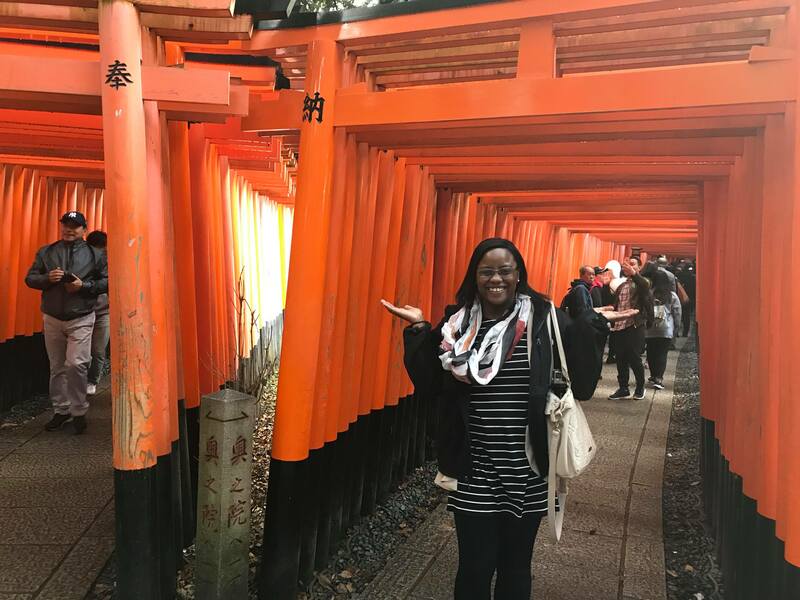 We made our way to the Fushimi Inari Shrine, which is the top famous place in Japan – four years running! It was truly amazing to the black and red structures in person. I didn’t realize how long of a trail they covered. We only walked a small portion of it. We witnessed a special ceremony in the temple when we walked back down, and they were very adamant about no photographs being taken. 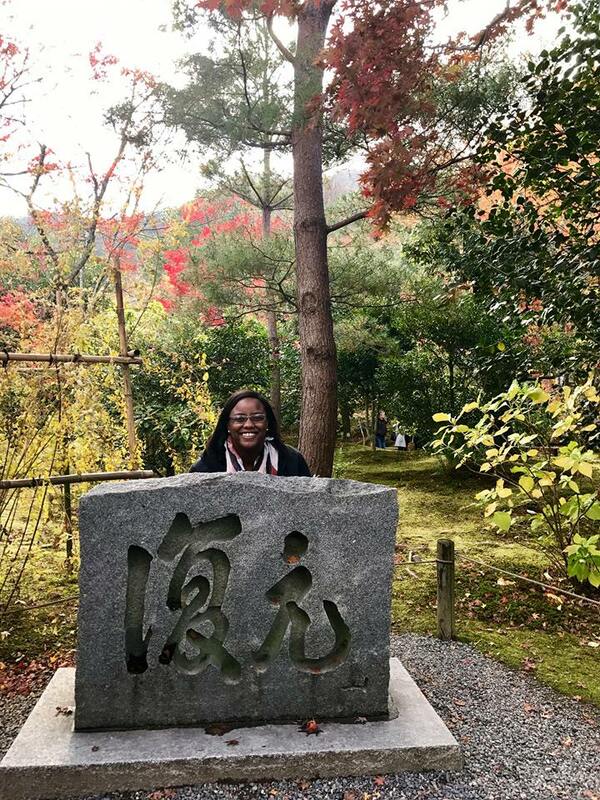 After, we hopped back on the train and headed over the Bamboo Forest. It was so cool to see how far the trees would bend when the wind blew! It seemed like they would snap, but of course they didn’t. Some of them came really close to touching the ground – it was pretty crazy! 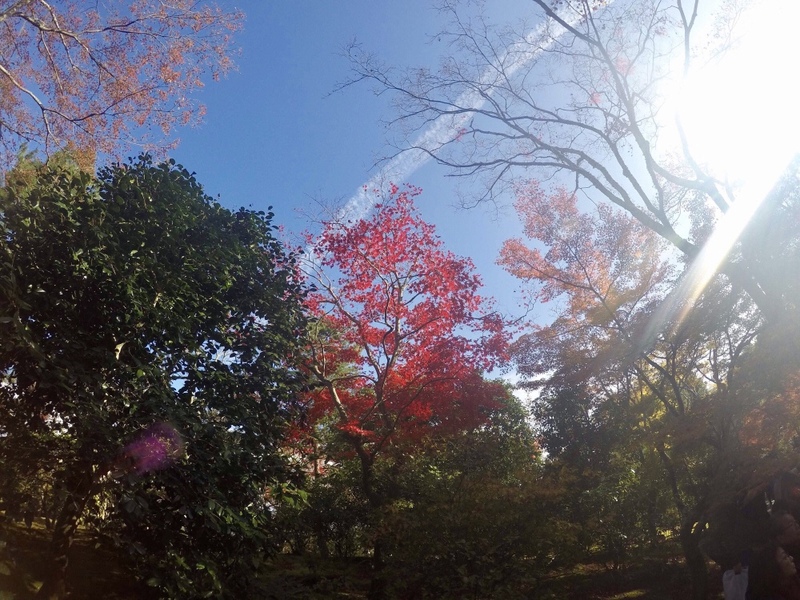 Fall is the most popular season because of all the beautiful, bright changing colors. It was Thanksgiving! In Japan, the day is celebrated as a day of “Thank you for you labor”/”Thank you for all the hard work you do”, which means a lot of people were off for the day. 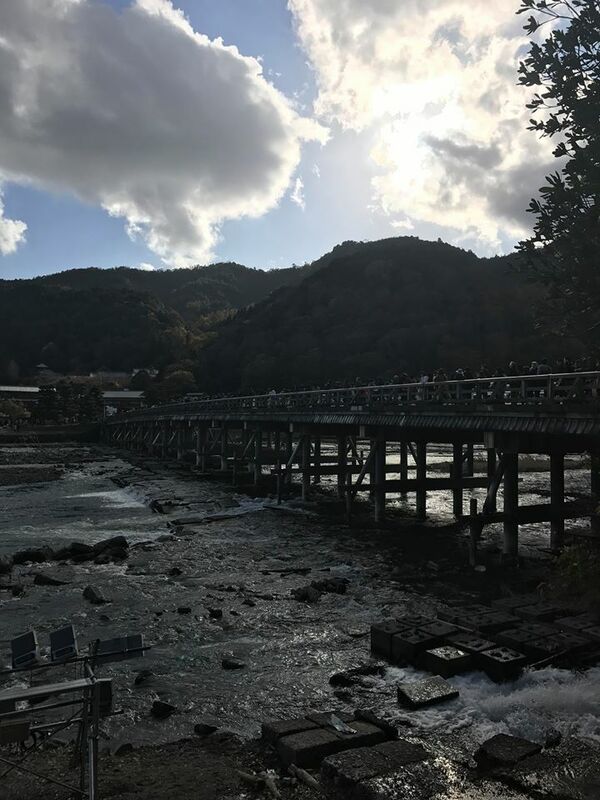 When we left the garden, we met up with Vika at the famous Togetsukyo Bridge of Arashiyama, as the other two [Telal and Mike] had earlier train reservations. The views there were also spectacular, and there were so many people in the area, there were police in the area doing crowd control. We headed back to the main train station to eat dinner, since our time was running out before we had to head back. 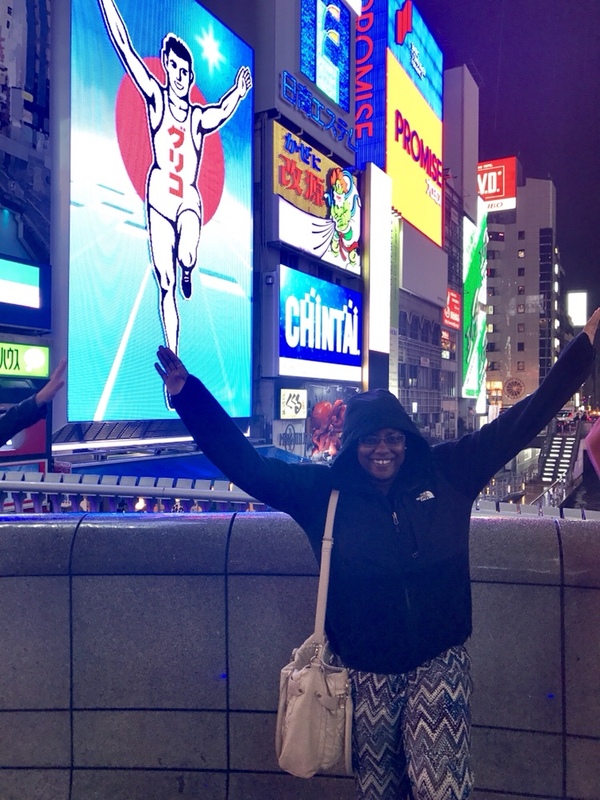 After eating a large dinner of rice, noodles, chicken, and dumplings, we grabbed our bags, made our way to the our platform, and hopped on the train – back to Tokyo! 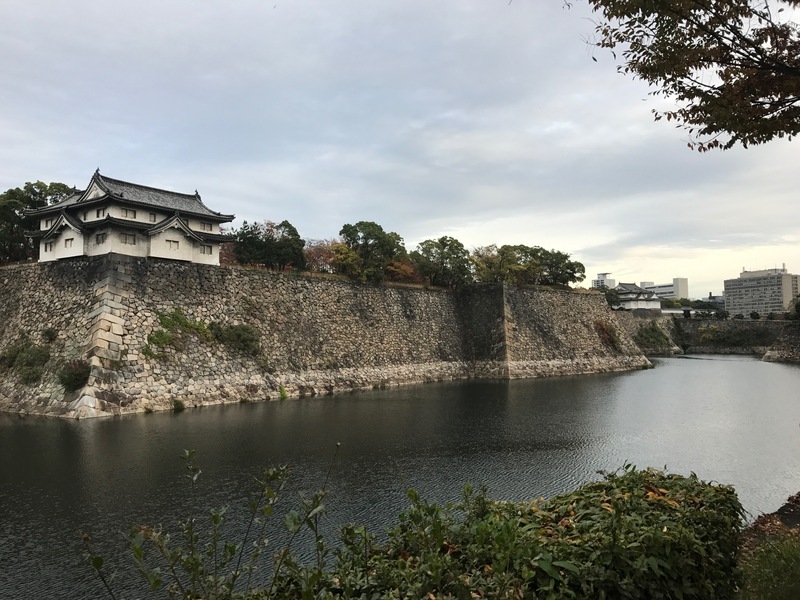 To read about the the rest of our trip in Japan [Friday and Saturday in Tokyo], head over to this post! As I said earlier, we definitely didn’t have enough time in either city to fully appreciate what they truly had to offer. 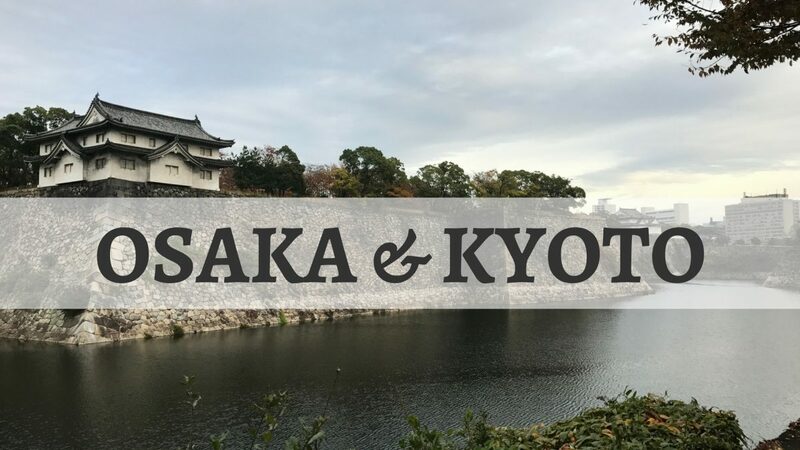 Regardless, I am thankful for the small time we were able to have in Osaka and Kyoto, and the memories we were able to create. Have you been to either city? Or have you ever done city day trips? Let me know about your experiences in the comments! I would love to hear about them! 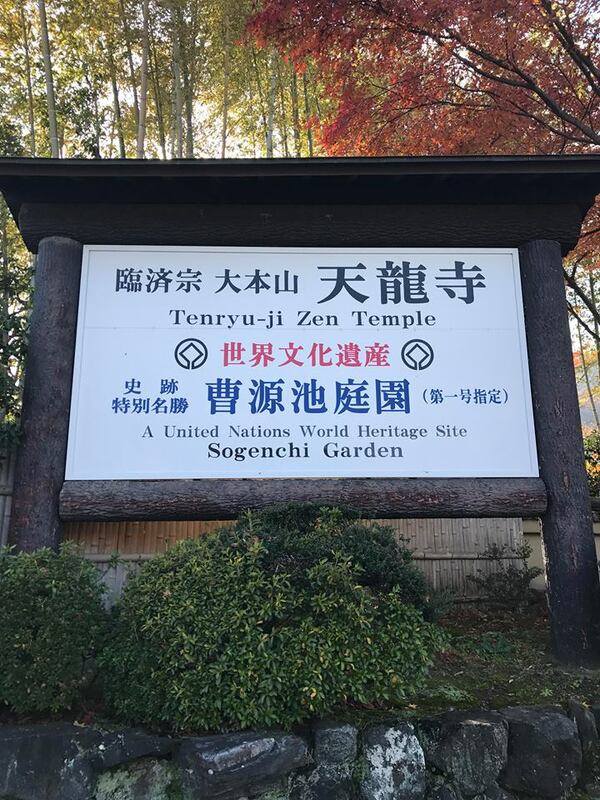 Wonderful insights about these two Japanese cities. 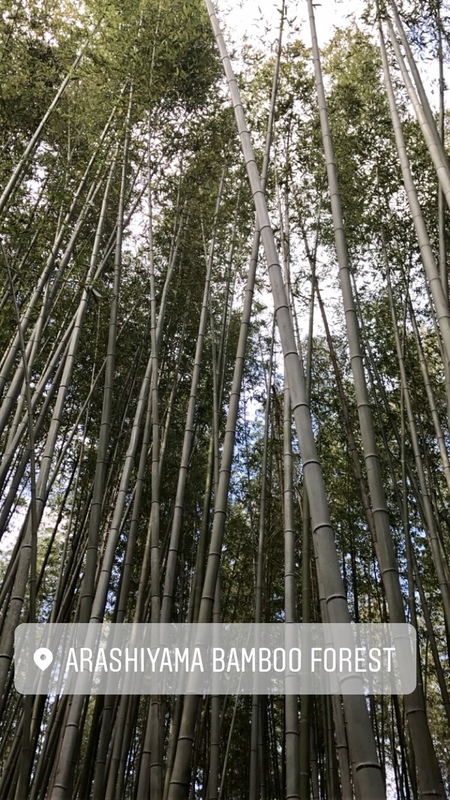 I would have loved to see the bamboo trees bend. Sounds awesome. I wonder what the special ceremony you saw was all about ? Do you know? I am feeling full just looking at the noodle pancake shot….made with 2 filling ingredients (noodles AND pancake), so no surprise here that it was filling. Watching the trees bend was so cool! And I have no idea what the ceremony was – I wish I did! As for the noodle pancakes, they were definitely filling! But I don’t think they had any actual pancake in them – just looked like one! looks like you had a great time! I’ve never visited Japan but would love to someday! Yes, I had a blast! I hope you’re able to visit one day soon! I’ve always wanted to go to Japan! Your trip looks like it was so much fun! This looks like such a fun trip!! Plus, the food looks amazing!! The food was simply delicious! I felt like all I was doing was just sampling various foods all day, every day!